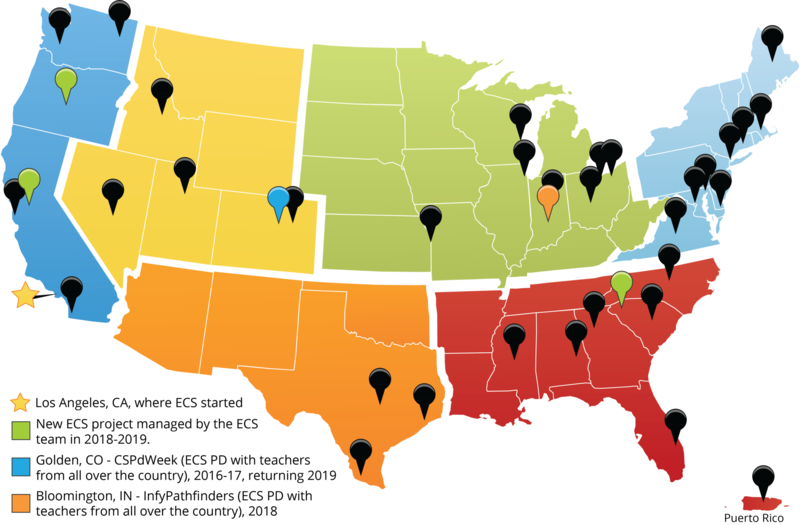 In recent years, ECS has rapidly expanded across the country and to Puerto Rico. Over 40,000 students participated in ECS courses nationwide in 2016-17 with an additional 10,000 in 2017-18. ECS is currently in over 25 states and Puerto Rico, including the 7 largest school districts in the U.S., as well as many small rural locations served by teachers who have participated in ECS PD at CSPdWeek or InfyPathfinders. For further information and inquiries regarding bringing ECS to your school or school district please contact Gail Chapman at chapgail@gmail.com.